Even if you aren’t paying much for health care and insurance right now, there’s always a chance you could land in the hospital with some expensive procedure that racks up bills faster than you can pay them. Fortunately, there are a number of angles with which we can attack high health care costs. It all starts with this basic premise: One major reason that medicine costs so much is that insurers, pharmacies, doctors and hospitals know a lot more than you do. To lower your bills, you’ll have to address this information gap. What is your insurance plan’s emergency care policy? There’s a two-pronged approach to keeping your general health care costs low: Get seen when you need to, and don’t get seen when you don’t. Avoiding a doctor’s visit might lead to higher health care costs later on, if you develop a serious condition or need to go to the ER. Remember to weigh long-term costs and risks alongside short-term ones. Find a doctor who corresponds by email. Both he and you would rather not have a visit if you don’t need it; you can shoot a quick email describing your symptoms and he can tell you if additional follow-up is needed. Use your insurance company’s nurse hotline. Many insurance companies, like Aetna and Blue Cross, have 24/7 nurse hotlines where you can speak with a registered nurse. They can give you advice on whether you need to go to an emergency room or urgent care, or whether you’ll be all right until your next appointment. Heads up! In some cases, your insurer might not cover name-brand drugs, so be sure to double-check how much you’ll have to pay. The most obvious way to save money on emergency care is to visit an urgent care center instead of an ER if possible. Same-day urgent care treatment can help with non-life-threatening conditions and provide quality treatment. Going to an emergency room costs $800 on average, compared to $10-$80 for urgent care or a regular doctor’s visit. Pro tip: If you need hospitalization, don’t put it off until the end of the week. Patients admitted on Fridays often have to wait until the next week to see a specialist or surgeon because of reduced staffing. Finally, you should be aware that urgent care centers have a list of conditions that they triage before scheduling a same-day appointment for you. They’ll let you know if your symptoms warrant immediate care. All these steps are preventative; now we’re getting to the fun part. This is where the information gap between insurers, doctors and hospitals on one hand, and patients on the other, comes into play. You can lower your medical bills, but you have to arm yourself with information first. 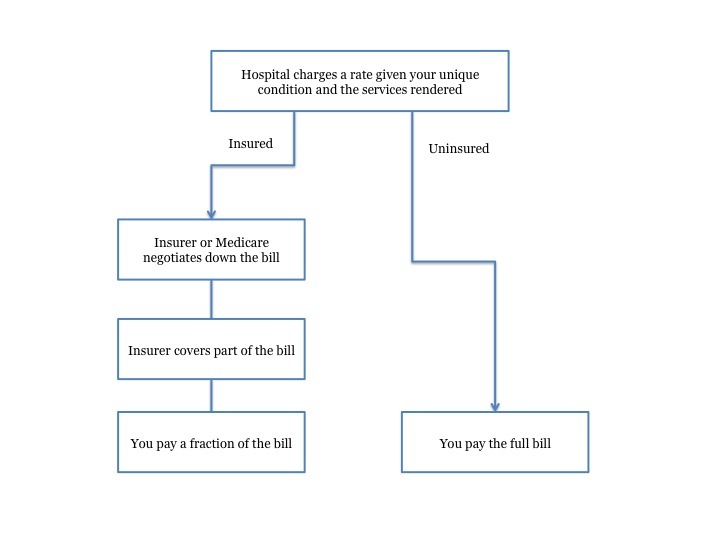 The cost to you (and the insurer) depends on how much bargaining power the hospital has. For example, Medicare insures millions of people and has enormous leverage. On average, it pays about 27% of the billed amount. But you’re unlikely to see these lower rates as an individual, unless you speak up. This sounds obvious, but it’s important: You need to sit down at the negotiating table knowing that you are overpaying for your services. Like we said, Medicare knocks off 73% of the bill on average, so you’re paying a very inflated rate. Armed with confidence and information, you can’t go wrong. You must now figure out how much insurers or Medicare and Medicaid pay for similar services. The NerdWallet hospital comparison tool shows you how much hospitals bill, and how much Medicare pays, for a given procedure in your area. Use this information as negotiating leverage to show that you’re paying too much. Another service, Healthcare Blue Book, can help you find what insurers pay for a given procedure. Talk to the hospital about your bill. Use the data you found in your research to say what you think a fair price is. Write down all the reasons they give for why your bill is higher. It’s important to let the hospital know immediately if you think you’ll have trouble paying the bill. They don’t want to send your debt to a collection agency any more than you want it sent, because then they’re settling for pennies on the dollar. Talk with a financial counselor – some hospitals have them on-staff – and try to negotiate a zero-interest repayment plan. Be careful about medical credit cards, because if you don’t pay off the bill in the allotted time, you may owe retroactive interest. You can also contribute to health savings accounts and flexible spending accounts pre-tax. If you have a high-deductible health plan, you can put money into a health savings account (HSA) tax-free and use it for medical expenses. If you don’t use all of your funds in one year, you can roll them over to the next year. Flexible spending accounts (FSA’s), on the other hand, are offered through employers and are available regardless of your deductible. Unlike HSA’s, your extra FSA money doesn’t roll over at year’s end, so you lose all unspent funds. Take control of your health care costs. Arm yourself with knowledge and know the time and place for spending, and in the words of Douglas Adams, don’t panic. Premium: The amount that you pay for your health insurance. It’s usually paid monthly, quarterly or yearly. Deductible: The amount you have to pay for health care before your insurance kicks in. For example, if your annual deductible is $1,000, your insurance won’t cover your medical expenses until you’ve spent $1,000 that year. Keep in mind that you might have to bear some costs, like out-of-network service, regardless of your deductible. Co-payment (co-pay): A fixed amount that you pay for a covered service. For example, you might pay $15 for every doctor’s visit. Coinsurance: Like a co-pay in that you’re footing some of the bill of your health services, but it’s expressed as a percentage of the total rather than a fixed amount. For example, you might pay all costs up to $1,000, and after you’ve hit the $1k mark, 15% of all costs beyond that. Your insurance will cover the rest. HMO (health maintenance organization): HMO plans tend to be cheaper, but more restrictive, than PPO’s. While you’ll have lower deductibles, premiums and co-pays, you’ll probably have more restrictions on which doctors you can see and higher costs for going out of network. Point-of-sale (POS): Point-of-sale plans occupy the middle ground between PPO’s and HMO’s. The deductibles, co-pays and premiums are lower than with PPO’s, but you can see an out-of-network provider as long as you get a referral and pay a deductible. High deductible health plan (HDHP): As the name implies, HDHP’s have higher deductibles and lower premiums than traditional insurance plans. If you have such a plan, you might be able to contribute to a health savings account (HSA) and pay off some of your medical costs tax-free.